Holy Family believes that developing a strong sense of wellbeing includes the ability to be present, centered and grounded in everyday life. When balanced, we believe students will be able to work and strive to meet their own potential, contributing to their school, home and community. When balanced, we believe students, staff and our local community can flourish. Holy Family’s vision of "Educating in faith for tomorrow's possibilities" extends to a commitment of improving students’ wellbeing now and in their future, becoming global citizens and stewards of God’s earth. In alignment with the National Student Wellbeing Framework, Holy Family identified Wellbeing as a school wide priority. The goal of fostering the wellbeing of students was placed into Holy Family’s 2018/2019 Annual Improvement Plan and discussed with staff before the commencement of the 2018 school year. A wellbeing team was formed to plan for the implementation of the Berry Street Educational Model beginning in 2019, as well as a range of school initiatives to raise the profile within our student body. Personal and Social Capability is one of the General Capabilities in the Australian Curriculum. Students with well-developed social and emotional skills are better able to manage themselves, relate to others, develop resilience and a sense of self-worth, resolve conflict, engage in teamwork and feel positive about themselves and the world around them. Holy Family’s Student Welfare and Management Policy serves as a framework for positive relationships and education within our school community. It supports the evidence based research of positive education, blending students academic learning with character & well-being. It also outlines our use of a Restorative Justice approach to support students in their behaviour, relationships and conflict. 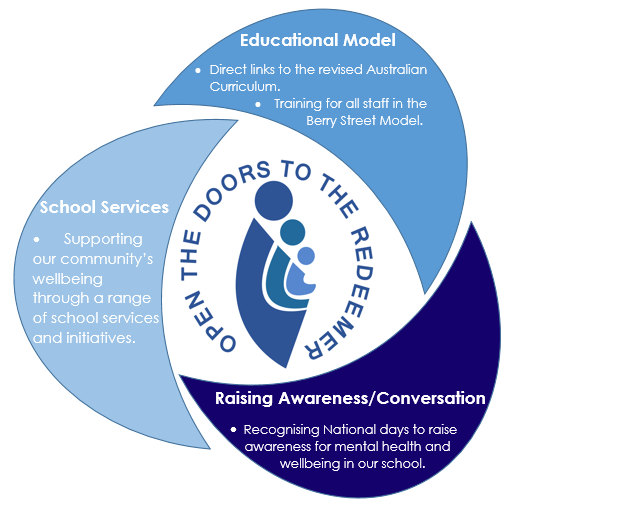 This approach uses a strengths based and reflective model to enhance the wellbeing of all students involved. Holy Family maintain that the wellbeing of our students is pivotal to their success at school, as adolescents, and in their future lives. Physically and emotionally healthy students are able to deal positively with life’s challenges and are well placed to develop into balanced and successful young adults. Through Holy Family’s commitment to wellbeing, we are beginning to embed the Berry Street Education Model into classrooms across the school. The Berry Street Curriculum is an evidenced-based program designed to support the sequential development of students’ physical, psychological, social and emotional capacities. It is designed to be responsive to the needs of students as they grow and flourish. The curriculum contains five domains: Body, Relationship, Stamina, Engagement and Character. Within these domains there are several focus areas that serve as age appropriate categories, taught across each Grade level. Calming spaces in every classroom as a designated space for students to access when wanting some quiet time. Buddy program that operates between preschool students and Year 5 students. This relationship continues onto the following year between Kinder and Year 6 students. Daily fitness that all students participate in. We understand the importance of a healthy body and healthy mind. Transition programs that operate for new students beginning Kindergarten. This involves students attending engaging sessions to meet their new teachers and see the school. We also run programs for students transitioning into High School and students to next year's class. Christian Meditation is held in every classroom at least twice, linking mindfulness with students personal faith formation. Buddy benches are located in different play areas for the students to use. If a student is feeling like they need a buddy, they sit on this bench and a teacher or fellow student walk over and help this student find a friend. Nutrition is taught across different year levels and the positive benefits of eating healthy foods. This is done as part of our participation with the Fresh Tastes program. Lunchtime clubs are offered on different days at lunch times to ensure all students have a variety of opportunities to mingle with students of similar interests and build friendships. Brain breaks are routinely implemented within classes as a quick and effective way for students to activate, energize and stimulate their brains. Holy Family understands that working in partnership with families and our community must be a priority to ensure our students, staff and broader community feel safe, secure and supported. We offer a range of different services for students, staff and families. Our Parent Network plays a part in this and supports students and families through various activities and events. They conduct many social gatherings throughout the year and advertise for ways in which our local community can volunteer their time and get involved. The Parent Network also help support families who are in need within our community such as experiencing grief or hardship. An example of this is through our care meal roster, providing families with food and lunch box snacks, easing the stress and financial burden of family meals. As a Catholic School, we work in partnership with Catholic Care to provide additional care for students who are struggling. This includes access to a school counsellor who visits the school weekly and builds a relationship and rapport with students. Seasons for Growth is another program that is run for selected students at Holy Family. Seasons for Growth is a small age-appropriate group aimed at those students who have experienced grief and loss. The Seasons for Growth program provides an opportunity for children to learn the knowledge, skills and attitudes required to understand and process grief and loss experiences. Holy Family is a Fresh Tastes school which means we are committed to helping families make healthy food choices. We understand the importance of keeping our body and minds healthy for our physical and mental wellbeing. Healthy Nutrition is taught across the school in order to educate students about food choices. Our school canteen uses the traffic light system in order to provide healthy and delicious options for our school community. 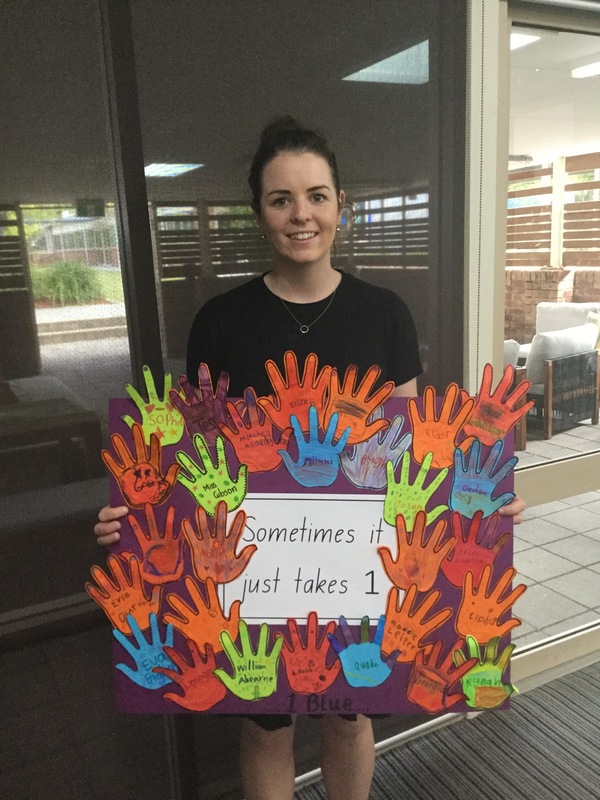 An important part of our journey to foster wellbeing at Holy Family has been raising awareness and conversation between staff, students and families. To do this, we have needed to develop ways we can authentically include student voice and participation. The Health and Wellbeing Stewardship team is comprised of approximately 15 Year Six leaders who are keen to raise the profile of positive mental health and wellbeing at our school. 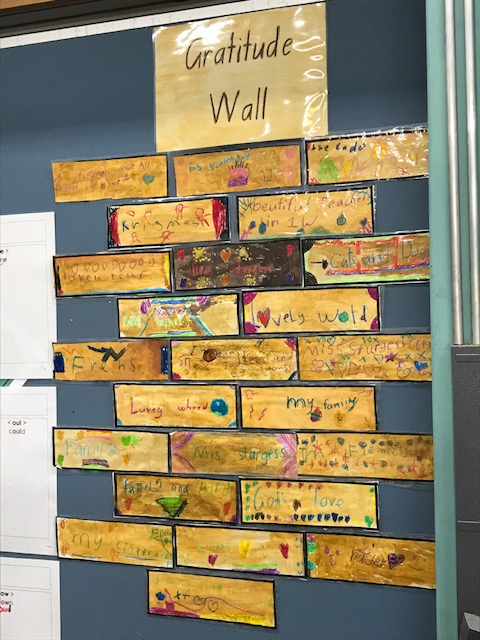 They work closely with the Wellbeing team of educators to facilitate activities across the school and attend events to increase their own knowledge of this important message. The below events give insight into the amazing achievements of the team over the last two years. Holy Family joined over two million students around Australia in recognition of The National Day of Action against bullying. The school came together to discuss this event and how we can combat bullying at our school. As part of RUOK? 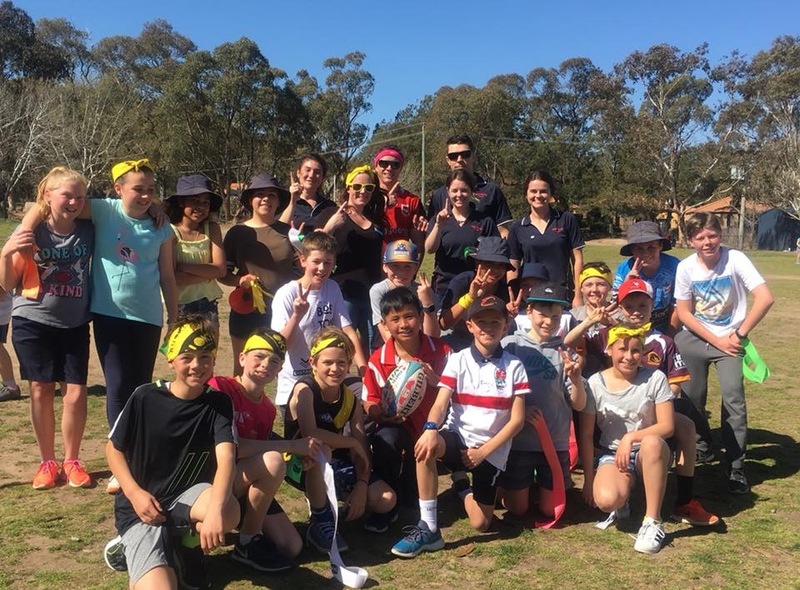 Day the Health and Wellbeing Stewardship Team organised a teacher vs student OzTag game. Teachers were happy to come away with a win after a close match with great sportsmanship and a large crowd cheering both teams on.#ruok? Research has proven that gratitude has significant links to our overall happiness and wellbeing. Research has also proven that being able to articulate who and what we are grateful for is becoming harder as new generations of children are brought up with differing values and societal influences. The students and teachers of Holy Family celebrated World Gratitude Day in 2018 by creating a wonderful gratitude wall in our school courtyard to discuss what we have to be thankful for here at Holy Family and in our everyday lives. Holy Family staff were joined by teachers from St. Francis of Assisi, St. Thomas and St. Benedicts to complete two days training in the Berry Street Education Model. Across the two days, teachers were trained in the implementation of two out of the five domains of this model, Body & Relationships. These concepts will begin to be rolled out across the school in 2019 as part of our Health programs.